If you haven’t joined the PokernewsBoy League at PokerStars, now is the time! The first PokerNewsBoy Home Game tournament is scheduled to take place on PokerStars on Tuesday, January 25th, at 18:10, but even if you can’t make that tournament there is plenty more planned for the future. The inaugural tournament is scheduled as a $5 + $.50 Freezeout, and will be counted in our PokerStars PokerNewsBoy League standings –there will be many more tournaments scheduled, with points awarded, throughout the year. PokerStars Home Games allow a maximum of 50 players in any one league, and spaces in the PNB league are going fast, however there are still openings for interested players. PokerStars allows each player to join up to three Home game Leagues, so make sure PNB is among yours. 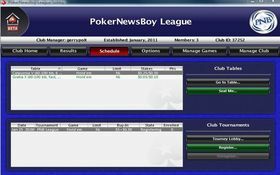 You will collect points for each tournament you participate in the PokerNewsBoy League, and a league leader-board will be kept, and there may just be some surprises and incentives for players who end the year atop the PokerNewsBoy League’s leader-board! For those that do not know, PokerStars Home Games allows players to form private leagues and create cash-game tables and tournaments strictly for the League’s players. Each league has a Manager (creator) who oversees the entire league, as well as appointing administrators who can create tables and invite players to join the league. The PokerStars Home Game helps bring together communities of poker players who may be spread all over the world, or are otherwise unable to participate in friendly games with one another. This entry was posted on Tuesday, January 25th, 2011 at 6:47 am and is filed under Poker News. You can follow any responses to this entry through the RSS 2.0 feed. You can leave a response, or trackback from your own site. I was hoping for a better turnout than 3 registered players 5 minutes before game time. If this is how the Home Leagues are gonna be, I shall ditch mine and not bother. Kind of sad as the idea is a very good one.